What language and which area of specialisation does it involve? How long is the source text (number of words)? How complex and specialised is the text, how much research and what specialist knowledge is required? Is creative translation required, e.g. translation of advertising slogans? Does the source text need to be edited because it includes, for example, tables or images from which the text needs to be extracted? How urgent is the translation? Would you like the translation at short notice, which would require it to be completed overnight or at the weekend? Are there any other client requests in addition to the translation? Every translation is different and, as a result, I can only prepare you a quote once I have seen the text. 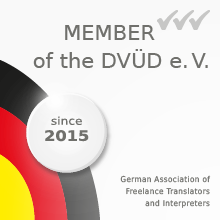 Depending on the translation, my basic rate is 0.14 to 0.22 EUR per word, and I would also be happy to submit a flat-rate fee at request. Please send me your text as a file attachment in an email and I will prepare a quote for you right away. Do you have any more questions? Then please get in touch! I am gladly at your disposal.